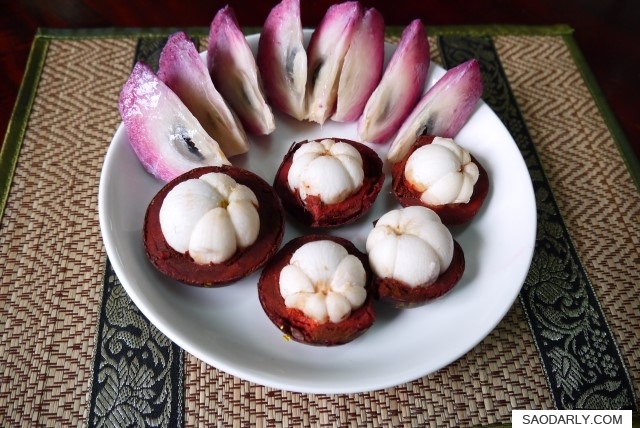 Organic purple mangosteen (Garcinia mangostana) and Star Apple (Chrysophyllum cainito) for breakfast in Vientiane, Laos. Chrysophyllum cainito is known in Lao language as Mak Nam Nom. We bought the mangosteen and star apple fruits from the Organic Farmer’s Market at That Luang esplanade. I love to eat fresh fruits for breakfast. For a fraction of the cost in Holland, I can eat as much organic fresh fruits while visiting Vientiane, Laos.